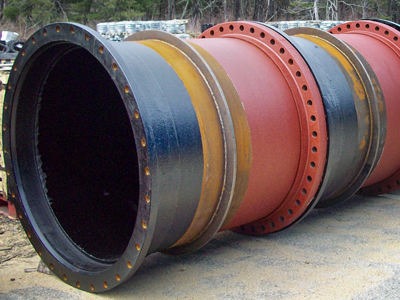 A flanged pipe is used for water, wastewater, air, oil and other liquids in aboveground service where rigid, restrained joints are needed. 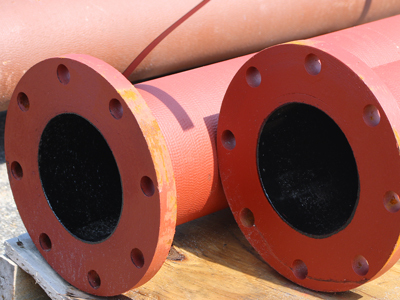 It's widely used in water and wastewater treatment plants, industrial piping systems, and other interior piping as well as exterior applications such as bridges and other elevated crossings. However, they have to be perfectly aligned with every other flanged pipe and fitting in your overall system, using nuts and bolts to hold the two flange faces together. This limits its flexibility in terms of only being able to rotate the fitting to a particular number of degrees, as the bolt holes must line back up. It is also a very rigid system and not recommended for underground use. These joints are sometimes alternatives to the flanged joint, and they are suitable for all specified applications, such as those found in treatment plants and pump stations. They work well because they only use two bolts on smaller pipes to create a compression fit and are not restricted to bolt hole patterns the way that flanged pipe is, allowing you to position the fitting at virtually any angle. At the same time, installation time is reduced. The ends can be butted together to create a rigid joint or left slightly apart to allow some flexibility in the final assembly. This is done by changing the distance from the end of the pipe that the groove is machined into the pipe. Wall pipes are manufactured on a lathe using a range of components, such as pipe, flanges and mechanical joint bell adaptors, for use in piping water through walls in water treatment plants and pump stations. Wall pipes are normally fabricated of special thickness class 53 ductile iron pipe, using threaded flanges or threaded mechanical joint bells. They have a flanged end to attach to flanged pipes on a building's interior, but the other end has a joint that is suitable for buried pipe applications to lock onto the buried pipe on the other side of the wall. Most wall pipes come with a waterstop that is securely welded to the outside of the pipe, which works to help anchor the pipe in the concrete of the wall as an embedded fitting and to prevent water from traveling along the outside of the pipe and causing stains on the wall. Generally speaking, wall sleeves are made from either steel or stainless steel. Steel sleeves are typically hot dipped galvanized to protect against corrosion. Though there are some plastic versions available, they tend to not be as popular. Wall sleeves include a waterstop that is securely welded onto the outside center of the pipe. This is typically a 2" ring, which helps anchor it within the wall system and prevents water building up on the outside of the pipe from traveling along the pipe and potentially staining the wall. Wall sleeves are not fittings specifically, but rather a place in the wall for a carrier pipe to pass through and be sealed at that point, unlike a wall pipe which is connected to plumbing at both ends. 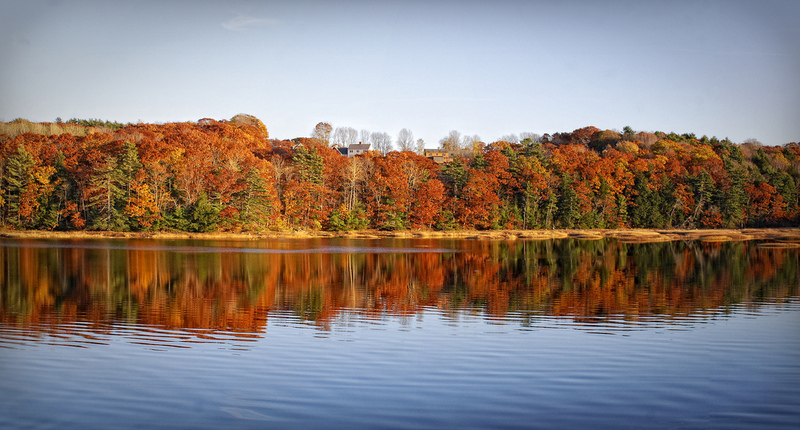 Though it's convenient to find the right solution for your water utility needs at the local store, it's more important to have the right products at hand to keep your water utility running effectively and safely at all times. Fortunately, the many options offered by Quality Water Products means that those unique solutions are always just a phone call or email away. Please feel free to reach out to our experienced associates today to learn more.